The Avatar Returns episode 42 is available for listening or download right here and on iTunes here. 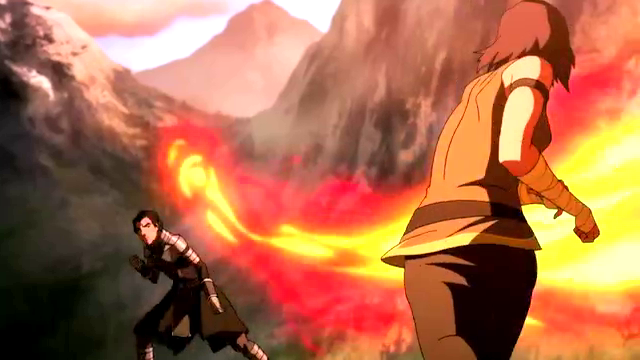 This week on The Avatar Returns, it’s a Badass Bender Beatdown as The Legend of Korra Book Four continues. In this corner, wearing the simple green tunic, the Ever-Lovin’ Blue-Eyed Avatar (we still have one of those? ), Korra! And in this corner, sporting a stylish Earth Empire ensemble of death metal, dancin’ and singin’ and movin’ to the groovin’, the Great Uniter herself, Kuvira! But first we take a road trip with the Air Kids in chapter 404, “The Calling” as Aang’s grandkids finally get the spotlight. And Toph proves why she’s a master storyteller. Then in chapter 405, “Enemy at the Gates,” Zhu Li does the mecha suit thing better than anyone else, and poor dim Bolin slooooooowly starts to figure stuff out. And finally, in chapter 406, “Battle of Zaofu,” Kuvira smacks the taste right outta Korra’s mouth. LET’S GET READY TO RUMBLE! This entry was posted in The Avatar Returns and tagged action, adventure, animation, avatar, avatar the last airbender, cartoons, comedy, fantasy, gobbledygeek, itunes, libsyn, podcast, television, the avatar returns, the brady bunch, the legend of korra, tv. Bookmark the permalink.